I remember quite vividly my first excursion to the Limited Too with my mom to buy a back to school outfit for my first day of fifth grade. The goal, of course, was to look as much like Cher Horowitz as possible while still abiding by the Jefferson Elementary School dress code. As I tried on several combinations of bright. bold plaids with stripes that decidedly matched, my mom regaled me with her astonishment that this style that she had worn as a teenager had been resurrected. She, of course, didn’t keep any of her clothes from high school– plus, I’m pretty sure the Limited Too tag in my velour shirt was just as valuable as the look itself. But I remember being so astonished that fashion behaved this way — that clothes could remain unchanged, but morph from radical, to the thing everyone has to have, to so-last-season, to Goodwill piles, and then somehow return to the spotlight decades later. Who calls the shots? Who decides this? And if we know the cycles exist, then why do we ever throw anything away? I racked my brain to imagine which trends I attributed to my own generation would ever make a comeback. I couldn’t even decide which styles were ours — everything seemed recycled all of a sudden. I didn’t mind this, of course, because I had a new royal blue plaid mini skirt and a velour green and blue and black striped shirt and lime green knee socks to wear with my clunky pilgrim-esque Steve Madden shoes and I was on top of the damn world. As if. My current wardrobe, while expansive due to a mild problem with online flash sales, is not terribly trendy. I lean toward more classic pieces– lots of basics. I do practice a halfhearted routine of getting rid of things I don’t want or the semi-trendy items that have cycled out. I’m not intentionally holding onto iconic 2010s couture (ha, like I even know what that is) to pass on to my hypothetical child. I do not anticipate the resurrection of anything from my closet. But it happened. And after a quick google search to confirm what I already suspected due the time at work that I spend with high school girls (and these are high school girls who simply don’t experience the physical awkwardness that I understood to be mandatorily linked to this age), it’s true. 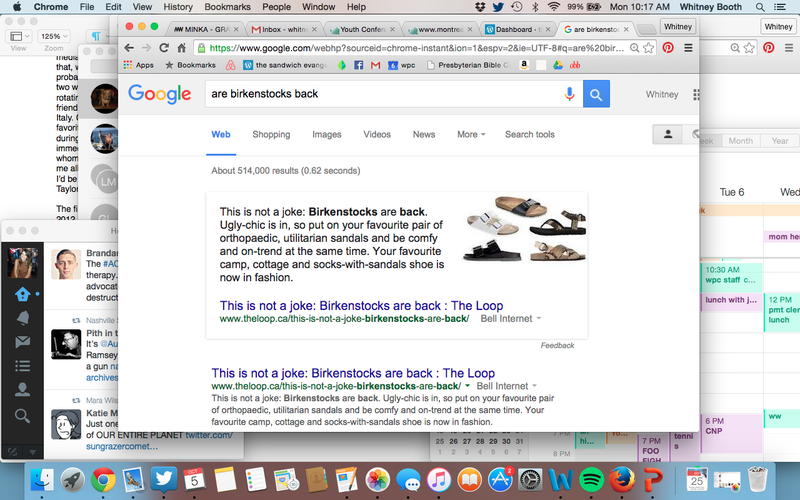 Birkenstocks are back. These bad boys are actually my second pair of this exact style of Birks. 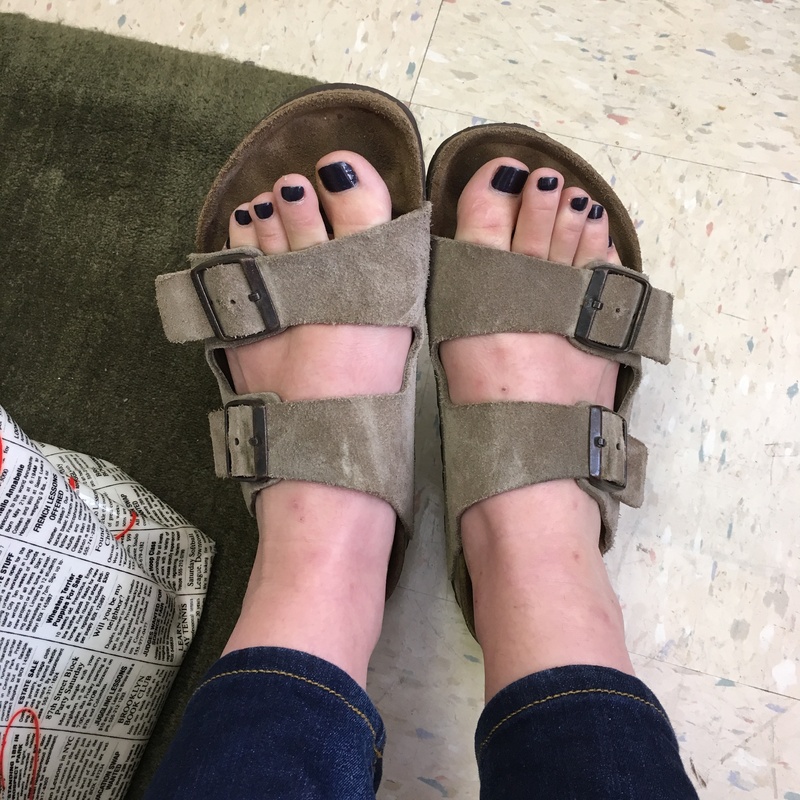 I burned through one pair of the Jesus sandals in high school and replaced them, but didn’t wear them much after the first pair wore out. I think I probably moved onto the trendier Rainbow flip flop (currently on pair #3 of those too). Because they were fairly new though, and because shoes are not often part of the purge, I kept them. So this morning, I went to my closet, spotted these long-neglected, patient friends, and slid my feet into them. And I could be totally off about this, and I might look like Joan Baez, but I am gonna rock the hell out of these cork and leather creations today because sometimes things fade out of view and come back around and we’re ready for them and this is one of those times.